All the settings on the main DLI SNUB Launcher panel are used for both standalone (mode -3) rendering and batch/network (mode -2) rendering. All the settings are fully enabled for all license versions of DLI SNUB Launcher. The FREE Lite license however only saves the lwsn Path between launches. Entering a registered license enables saving all the other custom settings between launches. For more in-depth information about any of these settings, see below as well as General ScreamerNet Command Line Syntax from our Mastering LightWave 3D ScreamerNet LWSN white paper. The DLI_SNUB-Launcher interface is composed of a series of buttons and fields that are used to build the command line needed to launch LWSN in Terminal/Command using simple drag-and-drop methods. Check buttons are used to enable/disable different optional parameters for the command line including all LightWave ScreamerNet LWSN General Settings. Buttons are used to open file dialog boxes to locate files or folders and perform other functions. The fields are non-editable and are used as readouts to show the current contents of the parameters. Both buttons and fields are targets which you may drag-and-drop files and folders onto to set them. All file and folder path fields will highlight green or red based on whether the file or folder path passes verification or not. You may also select text in any of the fields to copy to the clipboard. This can be useful to build the command line in a syntax verified manner and then copy/paste into the Terminal or into a text editor for creating scripts or shortcuts. The round (?) help button at the top right of the DLI SNUB Launcher panel will open your default web browser and bring you to this online manual. You may also use the Help menu in the Mac menu bar for direct access to every page of Mastering LightWave 3D ScreamerNet LWSN for more detailed information and tutorials about all aspects of using ScreamerNet lwsn on Mac OS X.
Click the lwsn Path button or drag the lwsn command line application (or ScreamerNet for LW9) from the desktop to the button or field to set the path to the ScreamerNet lwsn application to launch. The first time DLI_SNUB-Launcher is run the lwsn Path will default to look for a file named lwsn in the bin folder in the same folder as the DLI_SNUB-Launcher application or the latest version of LightWave Layout. 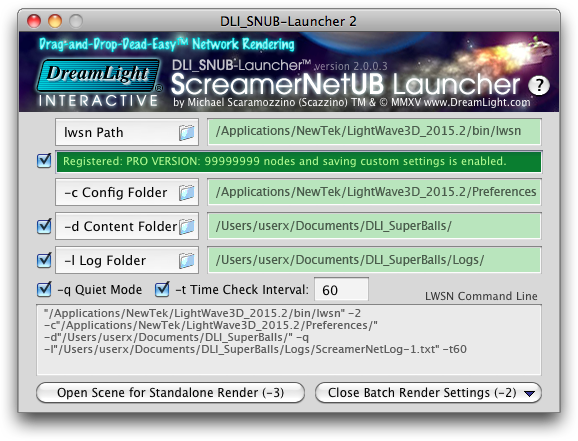 If you place DLI_SNUB-Launcher in the LightWave 3D applications folder, /Applications/NewTek/LightWave3D_2015.2 on Mac OS X or C:\Program Files\NewTek\LightWave_2015.2\bin on Windows, before its first launch, it will set the lwsn Path to the correct location without any further adjustment. If you wish to run DLI_SNUB-Launcher from a different location, or wish to use a ScreamerNet lwsn from another location, simply click the lwsn Path button and select the ScreamerNet lwsn file that you would like to use, or drag-and-drop the lwsn file, the LightWave3D folder, or the bin folder from the desktop to the lwsn Path button or text field. The field will automatically highlight green if it detects a valid path to lwsn on Mac OS X or to lwsn.exe on Windows, or it will highlight red if not detected. Once set, the lwsn Path is saved between launches of all license versions of DLI_SNUB-Launcher, including the FREE lite license version. This toggle check box button and readout shows which license version of DLI SNUB Launcher you are running, the FREE Lite 1-node unregistered version highlighted in red, or one of the registered licenses highlighted in green, standard STD 5-node, professional PRO 10-node unlimited, or enterprise ENT unlimited node version. The registered licenses will enable the saving of all the custom settings below the registered readout. The FREE Lite version will only save the lwsn path above the registered readout. The custom settings below the registered readout must be reset each time the FREE lite version is launched. See Registration & Ordering for more information about the various DLI_SNUB-Launcher licenses available for purchase. Click the -c Config Folder button or drag-and-drop a folder from the Finder to the button or field to set the path to the folder that holds the config files for ScreamerNet lwsn. This is the ScreamerNet -c command line argument. When DLI_SNUB-Launcher is first launched it will first look for a custom Preferences folder that you may have created inside the LightWave3D folder for Mac OS X users. If not found it will next look for the default config folder: /Users/userx/Library/Application Support/NewTek/LightWave/2015.2/ on Mac OS X or C:\Users\userx\.NewTek\LightWave\2015.2 on Windows, where 2015 is replaced with the current version of LightWave Layout, 9, 10.0, 10.1, 11.0, 11.5, 2015, 2015.2 etc. The name of the config file itself is Layout 2015 on Mac OS X or LW2015-64.CFG on Windows, where 2015 is replaced with the LightWave version number and 64 is either 32 or 64 on Windows. The field will automatically highlight green if the config file is detected and it will highlight red if not detected. In Mac OS X Lion (10.7) or later the user’s Library folder is hidden but you can still access it by using the Go->Go to Folder… menu item in the Finder and typing ~/Library into the text field, which tells it to open the current user’s Library folder. For more information about LightWave’s -c Config Folder and the Config File see Managing LightWave 3D ScreamerNet LWSN Config Files from our Mastering LightWave 3D ScreamerNet LWSN white paper. The check mark button allows you to enable/disable a custom Content Folder. Once enabled, click the -d Content Folder button or drag-and-drop a folder from the desktop to the button or text field to set the path to the Content Folder you wish to use to render scenes, objects and images from. The Content Folder will default to the last Content Folder that was set in the Config File from within LightWave Layout, or the current user’s Documents Folder if not found. This field will automatically highlight green if an Objects folder or any “.lwo” object files are detected within it, or it will highlight red if not detected. When disabled, the Content Folder that was last set in the Config File from within LightWave Layout will be used instead. This is the ScreamerNet -d command line argument. When loading scenes to render in standalone mode -3, DLI_SNUB-Launcher will warn you of a Content Folder mismatch and allow you to override this setting with the detected scene’s Content Folder. For more information about LightWave’s -d Content Folder (Content Directory) see Config Settings for ScreamerNet – Content Directory from our Mastering LightWave 3D ScreamerNet LWSN white paper. The check mark button allows you to enable/disable writing ScreamerNet lwsn output to a log text file rather than to the Terminal window. Once enabled, click the -l Log Folder button or drag-and-drop a folder from the Finder to the button or text field to set the path to the folder where you would like to save the log files. This field will automatically highlight green if the folder is user writable or red if not. The logs will be named: ScreamerNetLog-# where # is replaced with the current render node number. This is the ScreamerNet -l command line argument. This will default to a Logs folder inside the default Content Folder if available. For more information about ScreamerNet’s -l Log File see General ScreamerNet Command Line Syntax -l Log File from our Mastering LightWave 3D ScreamerNet LWSN white paper. This check mark button turns ScreamerNet’s optional -q Quiet Mode on/off to limit the amount of output ScreamerNet sends to the Terminal or to the log file. Much of this output may be useful when troubleshooting but can be unnecessary noce everything is up and running smoothly, so this option allows you to turn off much of the output. This is the ScreamerNet -q command line argument. For more information about ScreamerNet’s -q Quiet Mode see General ScreamerNet Command Line Syntax -q Quiet Mode from our Mastering LightWave 3D ScreamerNet LWSN white paper. The check mark button allows you to enable/disable ScreamerNet’s optional -t Time Check Interval that ScreamerNet UB lwsn will use to check for commands to abort or report status. Enter the number of seconds for the time check interval in the text field. This is the -t ScreamerNet command line argument. During batch/network (mode -2) rendering lwsn will check the job file at the specified intervals for abort or status commands to interrupt or report the current status, even while busy rendering. During standalone (mode -3) rendering it will report the current status at the specified intervals while rendering. For more information about ScreamerNet’s -t Time Check Interval see General ScreamerNet Command Line Syntax -t Time Check Interval from our Mastering LightWave 3D ScreamerNet LWSN white paper. This field shows the ScreamerNet lwsn command line as it is being built from the current settings. For batch/network rendering (mode -2) it shows the first node’s command line. For standalone rendering (mode -3) it shows the command line except for the scene and frame range which are set later when the scene is opened to render. You may select and copy the text of this field to copy the command line to the clip board. You may then paste the command line into Terminal or a text editor for manual editing and use if desired. This way you can use DLI_SNUB-Launcher to build your command line with drag-and-drop simplicity and let it verify the syntax for you to be sure to avoid syntax errors. For more information about ScreamerNet’s command line parameters see LightWave 3D ScreamerNet LWSN Command Line Parameters from our Mastering LightWave 3D ScreamerNet LWSN white paper.